Just enough to keep the individual boxes intact, although re-arranged by nature. A Dutch company has built a splashy high-rise hotel in Poland—and shipped it in 210 pieces to New York. The 20-story, 300-room project at 185 Bowery by hotel developer and operator citizenM is the biggest modular-construction hotel project ever in New York. 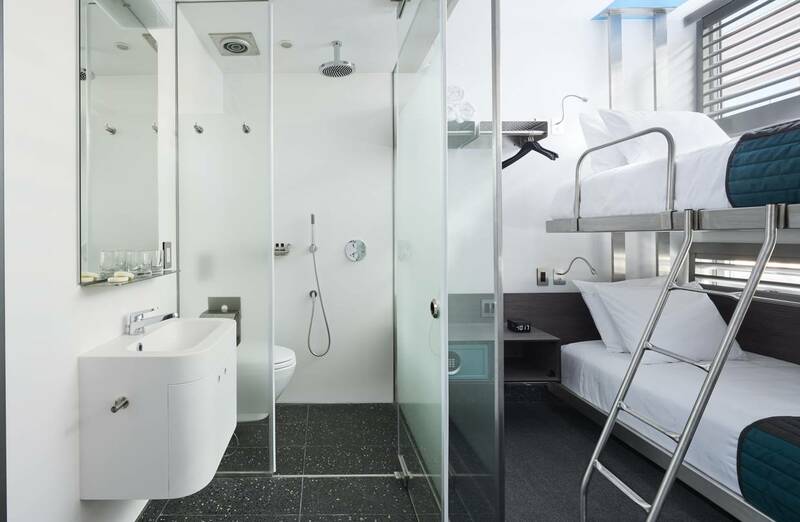 By stacking together factory-made, sealed units containing completely finished hotel rooms, citizenM expects to save time, improve quality control and cut down on traffic congestion and other construction nuisances. In Europe, permanent modular construction is widespread. CitizenM, which has nine open hotels and 14 in development, has used the technique to build a majority of its European properties, the company said. In the U.S., however, modular construction is less common, and is largely limited to residential projects. New York’s fledgling modular construction industry is hoping the citizenM project will provide an example of the technology’s advantages for hotel developers building in high-cost urban settings. The method isn’t necessarily cheaper, but it allows for quicker construction, meaning developers can open projects sooner, industry executives said. “So much centers on how quickly you get the hotel full,” said Roger Krulak, chief executive of Brooklyn-based Full Stack Modular LLC, which last year bought the core assets of the modular manufacturing company once owned by developer Forest City Ratner Cos.
CitizenM in 2015 chose the Polish company Polcom Modular, which has worked with citizenM in the past and has built numerous modular projects, to manufacture the units for the Bowery hotel. CitizenM co-owns the hotel with Brack Capital Real Estate. “We are 100% open to exploring new relationships with U.S. manufacturers,” said Ernest Lee, citizenM’s vice president of development and investments in North America. The modular approach lends itself to hotel developers aiming to replicate standard designs, especially in the affordable-boutique category with compact rooms and an emphasis on stylish amenities and common spaces. Developers of the $110 million Pod Brooklyn hotel in the Williamsburg neighborhood also opted for modular units from Polcom Modular. The 249-room property, which is expected to open in late spring, was about 15% cheaper to develop using modules than the typical on-site construction, said Michael Barry, co-owner of Ironstate Development Co., which partnered with CB Developers and SK Development on the project. Like other modular projects, citizenM’s Bowery project combines traditional and modular methods. Typical on-site construction was used to erect a three-story podium and a concrete structure housing elevator shafts, according to the Rinaldi Group, the project’s construction manager. Rinaldi is working with a team of about 10 workers from Polcom Modular to install 210 modules built in Poland. The modular installation, which began in late November, is expected to take about three to four months, compared with the six to nine months it would have taken to build that portion using traditional methods, said Anthony Rinaldi, chief executive of the Rinaldi Group. The number of truck deliveries to the site will be cut by about 1,200 compared with a conventional construction site, and the crane will be on site for about five months, compared with a year or longer normally, Mr. Rinaldi said. In New York City, the technology is suited for affordable-housing projects and smaller boutique hotels, potentially increasing the use of local union labor in two sectors where its share of the workforce has been historically low, said Gary LaBarbera, the president of the Building and Construction Trades Council of Greater New York. The unions have an agreement with Full Stack Modular.